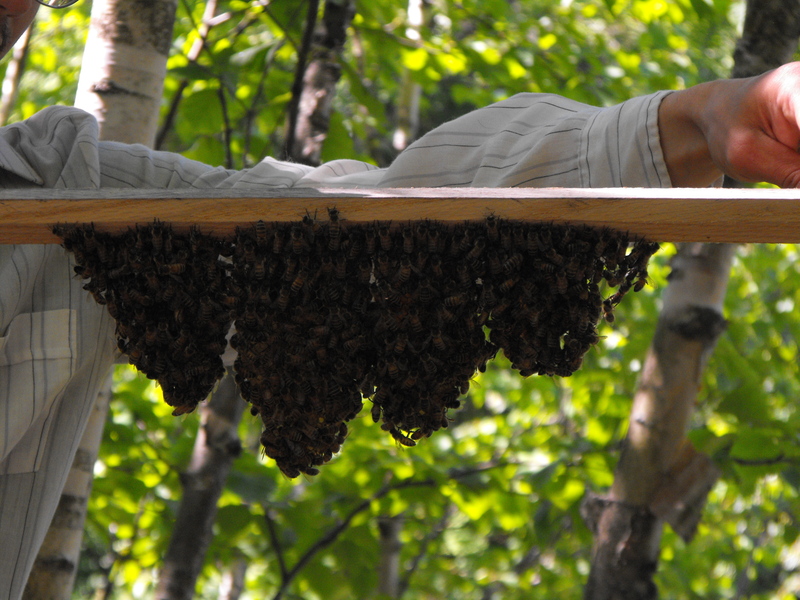 Someone has been stealing bees in Nova Scotia near Amherst, about two hours drive from here. Nine hives since May. Makes me angry just thinking about it. 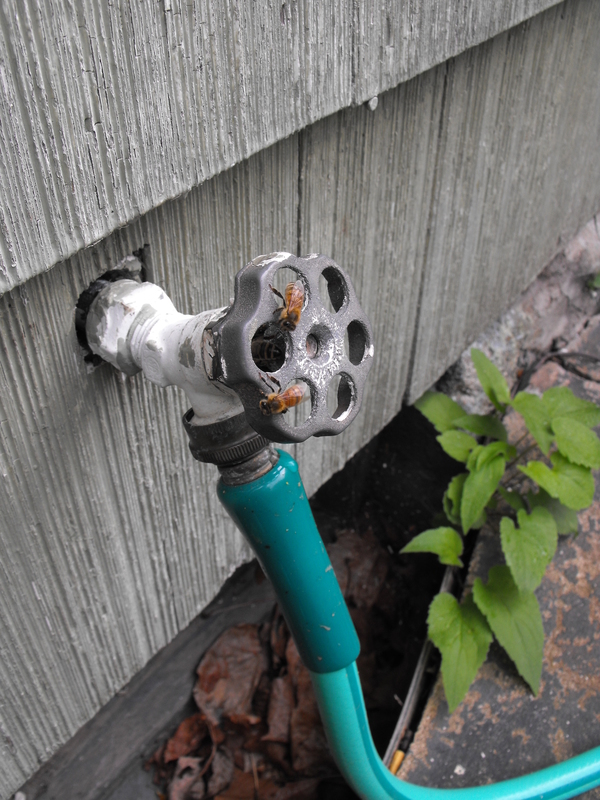 Interestingly though, the stolen bees seem to be some kind of bumble bee, or other “alternative” pollinator. The Chronicle Herald article describes the hives as “about the size of a case of photocopy paper and is divided into four sections, each with 1,200 bees.” Much smaller than honey bee colonies. I shouldn’t be surprised, but I didn’t know any of the commercial pollinators in Nova Scotia were using anything other than honey bees. 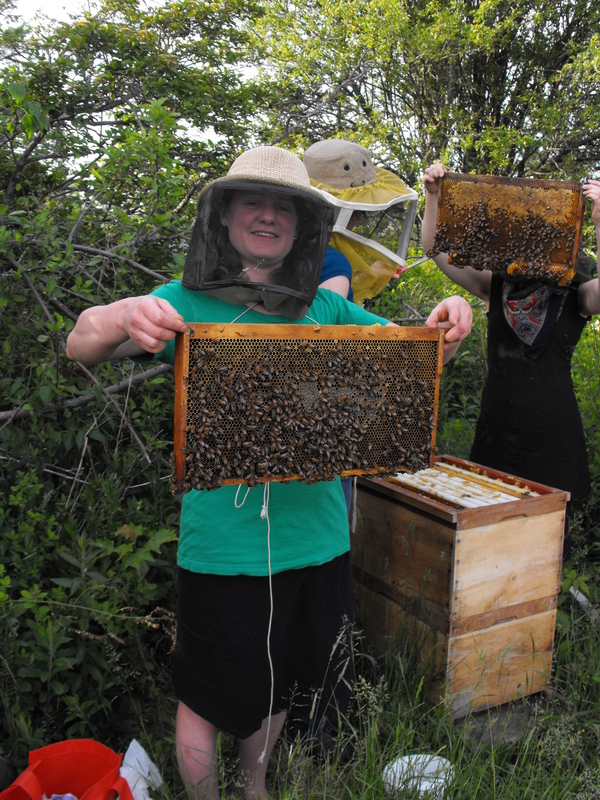 Last Wednesday I went on my first outing with the Halifax Honey Bee Society. If you live in this city, and you’re interested in bees, you really should get in touch with this group. They have a hand full of their own hives hosted in appropriately secluded yards through out the city. 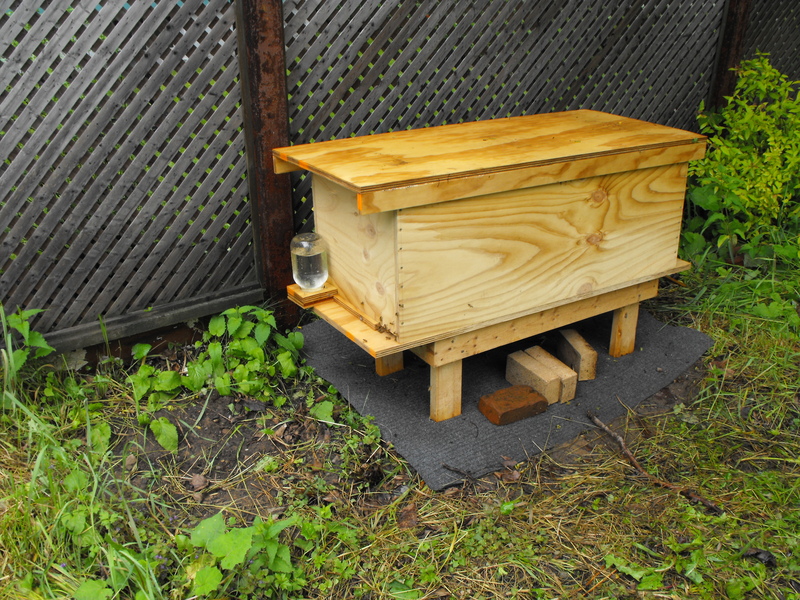 You can learn first hand without owning your own bees. Or, if you do have bees of your own, you should come out and talk with fellow enthusiasts and share what you know. Soon we were looking through one of the hives. Nicole and Katherine conducted the inspection. It was really nice to be around knowledgeable bee keepers. Despite all the reading I’ve done over the years, there’s no substitute for practical experience. For instance, I’d never seen a queen cell before, and now that I have, I can stop worrying every time I see the bulging cap of a drone cell. As you can see in this picture, there is absolutely no mistaking the two. The queen cell actually is the size, shape, and texture of a peanut shell, and those capped cells to the right of it are probably drone. Here’s my new friend Jen, holding a frame of bees for the first time. If you click on the photo for a closer look, you can see honey shining in the cells, and all the bees have their heads buried in the comb. We’d given them a fair bit of smoke by this point, so they were sucking back as much of the sweet stuff as they could carry. One never knows when a fire alarm might be the real thing. Looks like I missed a golden opportunity to catch a pretty big swarm at the Halifax Stanfield International Airport. The swarm landed on the tarmac at gate 26 on Monday morning refused to take off. Derek Forest, the airport’s Wildlife Control officer, was scrambling to find a bee keeper. Staff had originally considered driving back and forth over the three foot diameter puddle of bees in and attempt to crush them all. This option was quickly dismissed. Coincidentally, I was doing some work at the airport on Monday and Tuesday, but I didn’t hear about the swarm until after it had been collected on Tuesday by Roger Morash, president of the Nova Scotia Bee Keepers’ Association, whose farm is just a few kilometers down the road. Though I missing out on the swarm myself, I’m glad they didn’t bring in an exterminator, and it was great to spend the rest of the day talking about bees with folk at the airport. Thought I’d pass this along. There isn’t a whole lot of news in the story, but it’s nice to see bee-positive articles in the media. This yard has lots of young trees, so the hive is--and consequently, these photos are--shaded all day long. I was over to have a look at how Latifah was doing Saturday morning. Maybe that was a little too soon for a first inspection, but she’s set up across town and I don’t know if I’ll be able to get over there through the week. All looks well. I noticed they were bringing in lots of orange and white pollen. 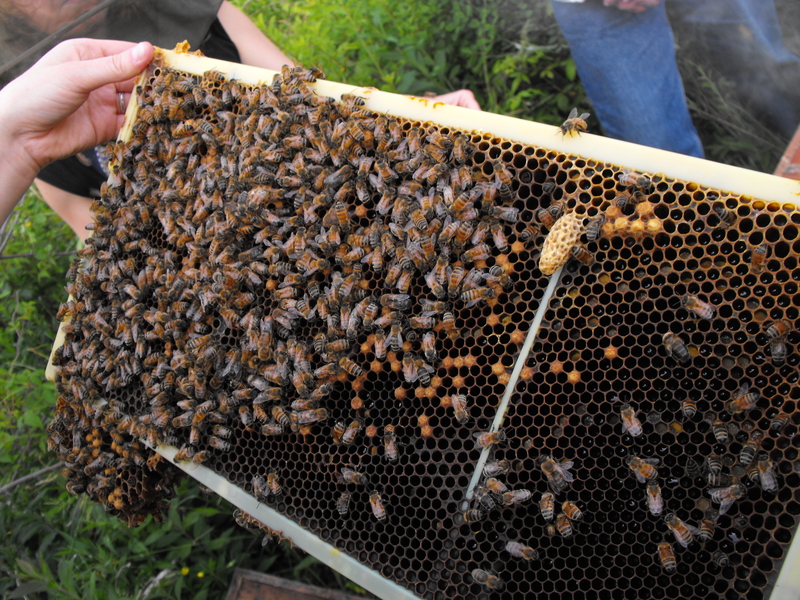 Inside, they’ve built an impressive amount of comb in just four days. They’ve only built on one of my top-bars though, and the rest was on the bottom of the frames that came with the nuc. Comb building is neat stuff to see in progress. The bees link legs and hang in a drape or festoon from the top-bars above. Perhaps this helps them plumb the comb as they draw the wax down. I’ll build an observation hive to get a better look at some point. They’ve started with numerous small lobes of comb. Chantal Foster, aka Mistress Beek, recently posted a great illustration of how the bees work these lobes together into one comb. I had a look at each frame, partly to make sure they were building straight comb, and partly to get myself used to being around the bees. I saw both brood and the queen herself. She’s marked with a blue dot, so it’s hard to miss her even in this shade. It was a good morning, even though one little girl did sting me on the wrist. Just her way of saying that visiting hours were over and it was time for them to get back to work. 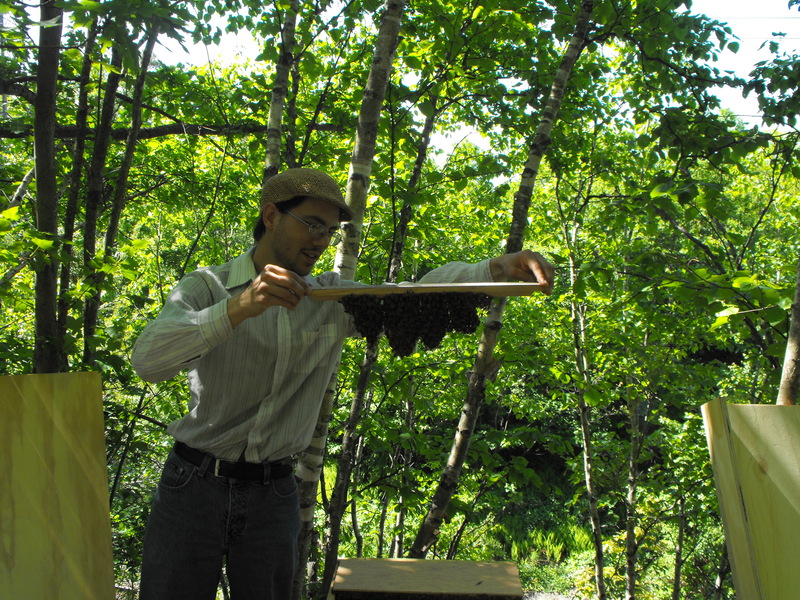 When I was growing up, my father kept bees at our home in northern New Brunswick. In the beginning, he ordered packaged bees from somewhere in the southern United States. (My mother tells a fantastic story about the time one of the packages broke open at the post office in town.) Later, when the border was closed to honey bee imports because of the varroa mite, Dad was able to buy nucs from bee keepers closer to home. These nucleus hives were only available later in the season than the packages had been and Dad wasn’t very happy with them. They didn’t seem to build up quickly enough, and sure enough, they died out just about every winter. Discouraged by loss after loss, he gave up on the project before I was in high school. Only after the bees were gone did I develop an interest in them, and over the years it’s become an obsession. I have all of Dad’s old bee books, and I’ve added a great number to the collection. I probably know more about bees than any non-beekeeper you are ever likely to meet. Then again, I am no longer a non-beekeeper. For years, I believe it couldn’t be done. I lived in various city apartments with no yard, nor the money to pay for a complete set of conventional Langstroth-style equipment. Also, I was discouraged by the understanding I was given by a lot of recent literature that bees could no longer survive without constantly being medicated for a whole host of parasites and pathogens. I wasn’t interested in becoming a pharmacist. Then one day I read about top-bar hives and suddenly there was hope again. 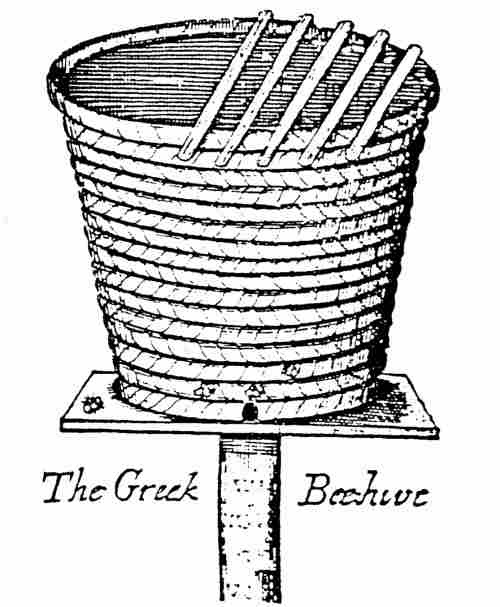 Some people claim this style of hive was developed in the 60’s or 70’s for aid work in the third world (Like Ghana or Woodside), but as early as 1682, the Englishman Sir George Wheler included a sketch of a Greek top-bar hive in his A Journey into Greece. Regardless of when they were invented, they are becoming very popular today. They are cheaper to build, and simpler to maintain than conventional equipment. And more importantly, it seems that bees kept in this style of hive are healthier and more able to deal with the list of ailments that afflict conventionally kept bees. This healthiness is usually attributed to the lack of wax foundation, allowing bees to build their comb as they see fit as opposed to the dictates of an embossed pattern. The best information I’ve found on top-bar hives comes from Dennis Murrell’s Bee Natural blog, and it’s predecessor, the BWrangler site. 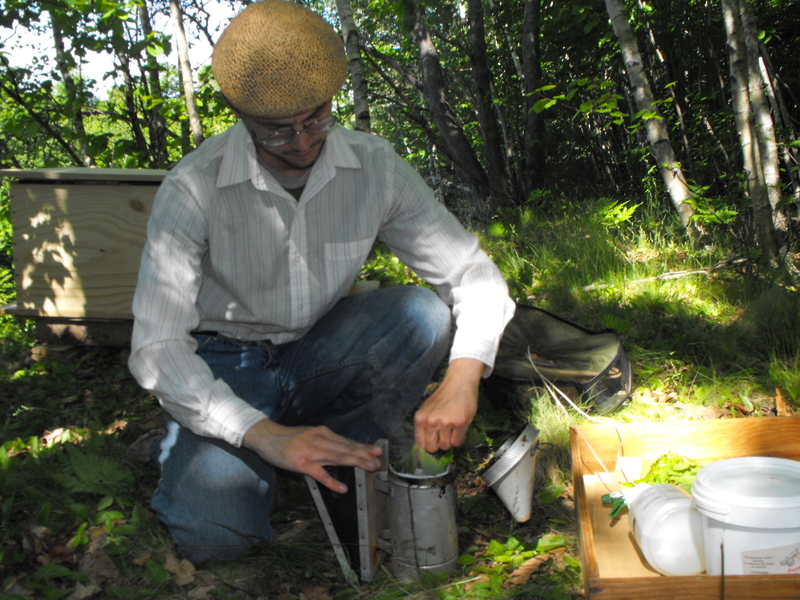 Dennis’s writings have influenced just about every beekeeping decision I have made so far. If he ever compiles all that good stuff into a book, I will be first in line for a copy. Thanks Dennis.